The "Entwicklung" tank series (= "development"), more commonly known as the E-Series, was a late-World War II attempt by Germany to produce a standardized series of tank designs. There were to be six standard designs in different weight classes, from which several specialized variants were to be developed. This intended to reverse the trend of extremely complex tank designs that had resulted in poor production rates and mechanical unreliability. The E-series designs were simpler, cheaper to produce and more efficient than their predecessors; however, their design offered only modest improvements in armor and firepower over the designs they were intended to replace, such as the Jagdpanzer 38(t), Panther Ausf.G or Tiger II. However, the resulting high degree of standardization of German armored vehicles would also have made logistics and maintenance easier. 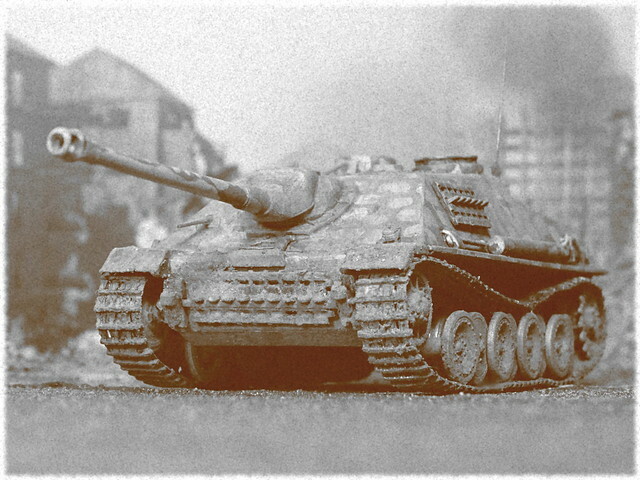 Indeed, nearly all of the E-series vehicles — up through and including the E-75 — were intended to use what were essentially the Tiger II's eighty centimeter diameter, steel-rimmed road wheels for their suspension, meant to overlap each other (as on the later production Tiger I-E and Panther designs that also used them), even though in a much simplified fashion. Compared with the earlier designs, the amount of drilling and machining involved in producing the Standardpanzer designs was reduced drastically, which would have made them quicker, easier and cheaper to produce, as would the proposed conical spring system, replacing their predecessors' torsion bar system which required a special steel alloy. Focus of initial chassis and combat vehicle development was the E-50/75 Standardpanzer, designed by Adler, both being mostly identical and only differing in armor thickness, overall weight and running gear design to cope with the different weights. There were also lighter chassis variants, though, including the light E-5 and E-10 for armored, tracked reconnaissance vehicles and the E-25. The E-25 designs, in the 25-50 tonnes weight class, were to be the replacements of all Panzer III and Panzer IV based designs, with Alkett, Argus and Adler, with involvement of Porsche. This family would include medium reconnaissance vehicles, medium Jagdpanzer and heavy Waffenträger, using five Tiger II style road wheels per side, combined with "slack-track" design. Track propulsion was switched to a rear drive sprocket, as a consequence of mating the engine and the gearbox into a tail-mounted, single and very compact power pack that made the voluminous and heavy power train through the hull obsolete. This allowed the gun mount to be directly attached to the hull floor, which lowered the overall silhouette, and the gained space offered more room for the crew’s operations as well as for ammunition storage. 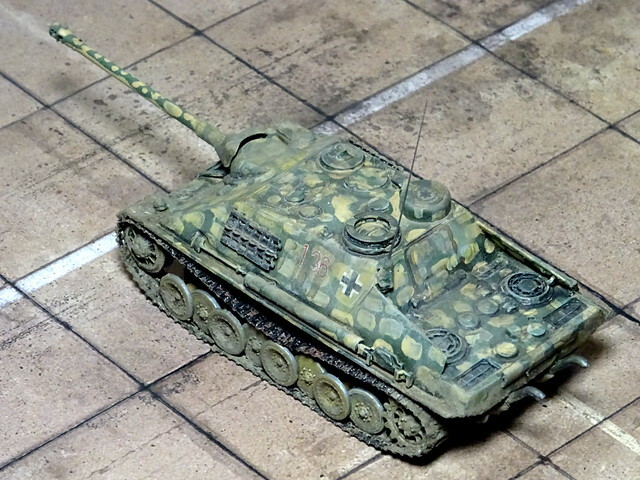 The medium tank hunter received high priority and the project was called Jagdpanzer E-25/88 and ran under the inventory ordnance number "SdKfZ. 310/2" . It was to replace various Panzer IV tank hunters and the light "Hetzer" from 1945 onwards, which all either suffered from insufficient firepower, lack of mobility, or armor. Another tank the E-25/88 would replace was the excellent but complex and expensive Jagdpanther with its 8.8 cm Pak 43/3 or 43/4 L/71 cannon. The Jagdpanzer E-25/88 was to eradicate all problems of the Panzer IV tank hunter family and combine the benefits from all former types, including the powerful 8.8cm PaK, which could take down any Allied tank around late 1944 at considerably distances. Even though the E-25 tank hunter was initially to be outfitted with the proven 7.5 cm/L70 gun from the Jagdpanzer IV and the Panther battle tank, it was surmised that this armament would not be enough for the enemy's next generation tanks. 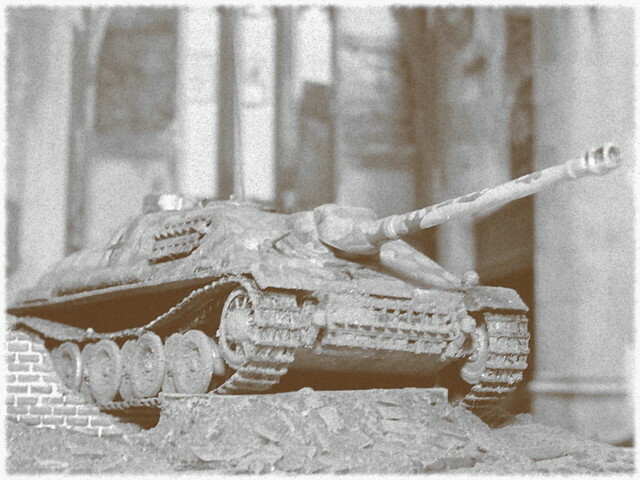 Beyond its heavy armament, the new tank hunter was to offer good protection through armor and hull shape alike, as well as high mobility, while keeping overall weight at around 30 tons (the Jagdpanzer IV weighed roundabout 25 tons, while the much bigger Jagdpanther weighed 45 tons) and overall size smaller than the Jagdpanther. Heavier tank hunters than the E-25/88, based of the new E-50 and E-75 chassis were under development in parallel, but they were all to carry heavier guns, including the 12.8 cm PaK and newly developed 10.5 cm and 13 cm cannons. An E-100 SPG on the drawing board (called "Krokodil") was to carry a 15 cm or even a 17.5 cm anti tank gun. In late 1944, with the Allied invasion in the West and rising pressure from the East, anti tank and assault SPGs were direly needed and the rejuvenation of the German tank force was sped up in a hurry. 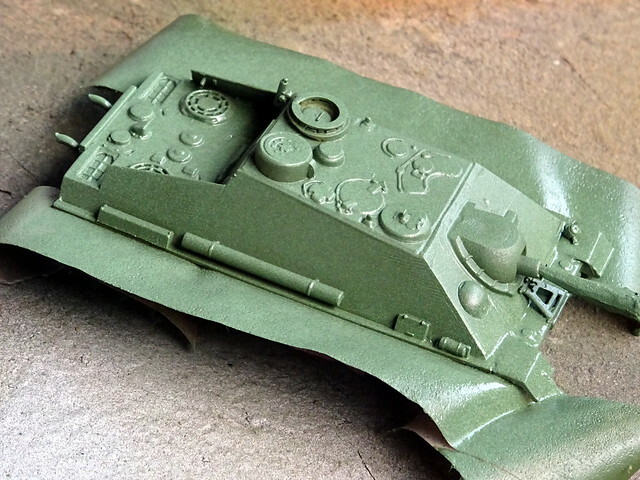 As a consequence the Jagdpanzer E-25/88 was prematurely ushered into production before the medium E-25 chassis development had been fully completed. As a stopgap solution, initial production tanks were outfitted with a Henschel running gear that dated back to the canceled VK20 and VK30 tank program. However, its overlapped and interleaved roadwheel-based suspension system (called “Schachtellaufwerk”) was a considerable improvement against the Panzer IV design, even though it was more complex than the final E-25 system. Around 80 vehicles were produced with the Henschel suspension until production was switched to the simplified Alkett suspension based on the unified wheels of the bigger Einheitspanzer types. The upper hull remained basically the same throughout production, though, and was based on proven principles. To accommodate the heavy-calibre gun, much as on previous unturreted tank destroyers, the glacis plate and sloped hull sides of the Jagdpanzer E-25/88 were extended up into an integral, turretless fixed casemate as part of the main hull itself, providing a relatively roomy interior. The Jagdpanzer E-25/88 had side armour of up to 60 mm, frontal and gun mantlet armour was 80mm. The E-25's engine was a Maybach HL 101 with 550 PS (539 hp, 341 kW), another recognizable improvement in comparison with its frequently underpowered predecessors. Maximum speed was up to 52 km/h (32 mph) on level ground, and the interleafed running gear allowed a smooth ride and high speed even in rough terrain - even though the complex design meant that the wheels could clog up easily with heavy mud or snow. The gun was mounted in a central "Saukopf" mantlet, similar to the Jagdpanzer IV, and had a limited traverse of 11° to each side, with an elevation of −8° to +15°. 50 rounds for the main gun could be stowed. A single 7.92 mm MG-34 machine gun for frontal defence and against soft ground targets was carried in a ball mount on the right side of the front glacis plate, operated by the wireless operator. Another MG-34 was mounted in a remotely controlled turret on top of the hull, operated by the commander who sat under a cupola with seven periscopes for a good field of view. This machine gun was, in later production tanks, to be replaced by a 30mm MK 108 (actually a compact, belt-fed aircraft machine gun), but this was never carried out since MK 103 production was completely allocated to the Luftwaffe. The driver sat on the left. The gunner had a visual rangefinder and a periscope telescopic sight. The periscope - linked to the gun mount - was under an armored housing on the roof. In service the vehicle was, due to its crouched silhouette, unofficially called "Dachs" (Badger), a name that was quickly adopted in official circles, too. The first vehicles reached Western front line units along the Rhine in March 1945. They proved to be very successful and popular with its crews, because the tank was agile, easy to handle and less cramped than most of its predecessors. Total production reached 250 vehicles until the end of hostilities, and many of the E-25/88s design features were later incorporated into the post WWII “Jagdpanzer Kanone” for the German Bundeswehr. An unexpected second entry for the 1 Week GB - this one was finished much quicker than expected (and started just last Thursday!). 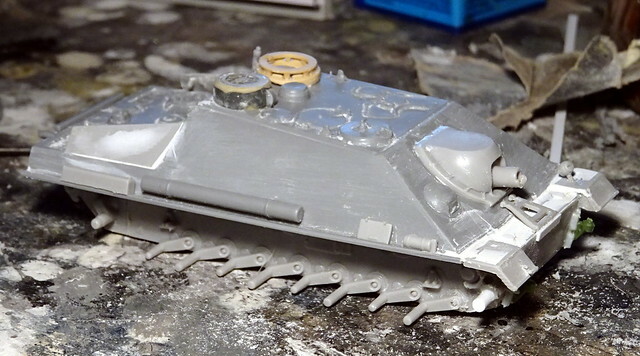 It does not look spectacular, but this compact tank hunter is a major kitbashing, inspired by - but not necessarily an exact model of - the real but unrealized German E-25 Jagdpanzer project. Things started with a leftover chassis from a Trumpeter "Sturer Emil" SPG with an early interleaf suspension design and a relatively long hull. 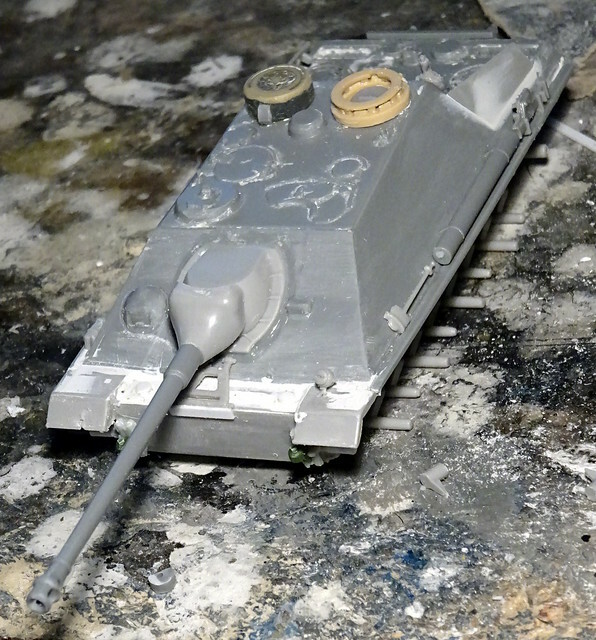 I wanted to save it and incorporate it into a Heer '46 design, and soon the idea of a Jagdpanzer IV successor was born. Selling it as an E-25 design and incorporating a bigger gun was a logical step. The build was very pragmatic. 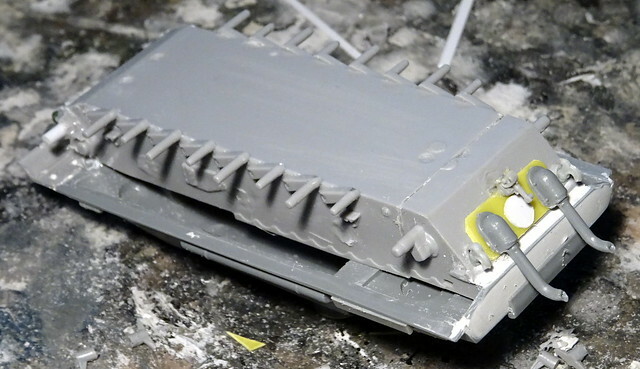 The lower hull with the wheel attachments was taken OOB, but it was shortened by 5mm. This was achieved by simply taking away a plug behind the last road wheel and in front of the sprocket wheel, which was moved from the front to the rear end. While this sounds simple, the attachment points’ different diameters and the need for a sturdy construction (due to the kit’s vinyl tracks) posed quite a challenge. In the wake of this modification, the track’s support wheels were deleted, too, for the E-25’s simplified “slack track” layout. The tracks were shortened accordingly, and mounted/fixed with super glue (as one of the final steps after painting). 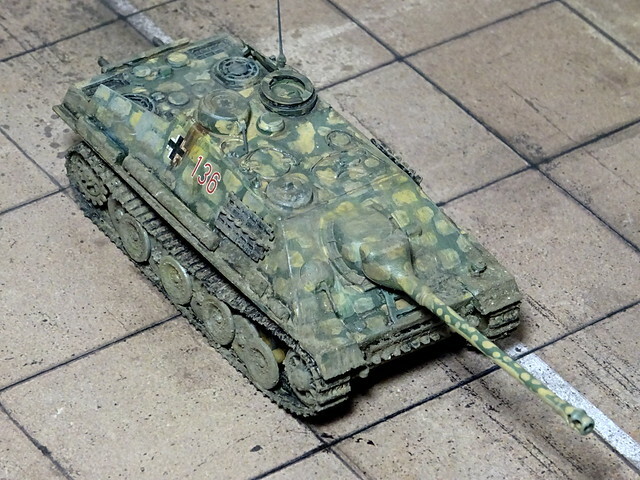 The upper hull comes basically from an Armorfast Jagdpanther, after several trials with a Jagdpanzer IV, a Brummbär and even a potentially scratched casemate. 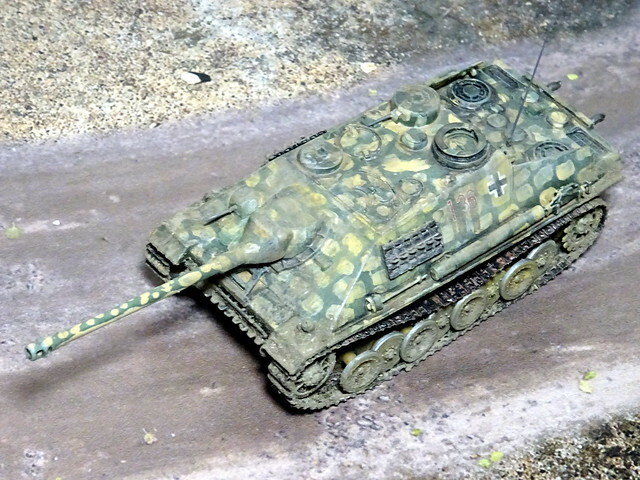 The Jagdpanther hull was reduced in height, though, and also slightly shortened, so that the new tank would be more compact than a Jagdpanther and also differ in the silhouette. In order to change the look even more, the “Saukopf” gun mantlet from a Jagdpanzer IV/70 was implanted (even though with an 8,8cm barrel), as well as the vehicle’s protective shields for the motor deck. Overall hull width was adapted to the Sturer Emil tracks through mudguards. 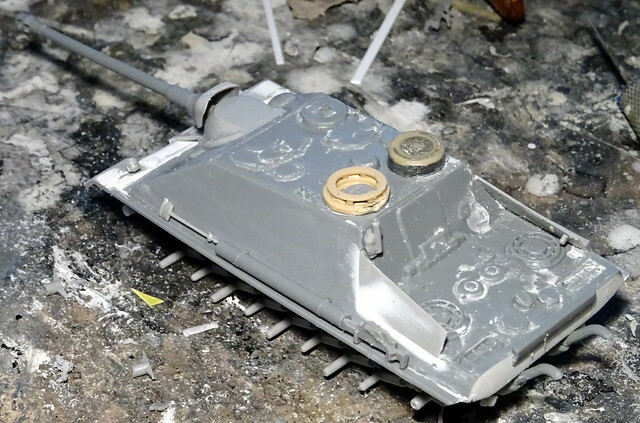 The machine gun turret was scratched, and some other details changed or added, including some periscopes, a Panzer IV commander cupola and some equipment pieces on the mudguards. This time, I wanted a disruptive scheme for this tank hunter, and adopted a rather simple livery for the E-25/88: a uniform RAL 6003 Olivgrün for the upper hull (appied with a rattle can, plus a hush with RAL 6011 on the upper surfaces), with a dense, irregular pattern of sand/yellow blotches - lighter than the authentic RAL 7028 Dunkelgelb, though (I have used Humbrol 103, Cream). Wheels and the lower hull flanks (behind the running gear) were painted in RAL 7028 Dunkelgelb (RAL 8000, which comes pretty close, IMHO). 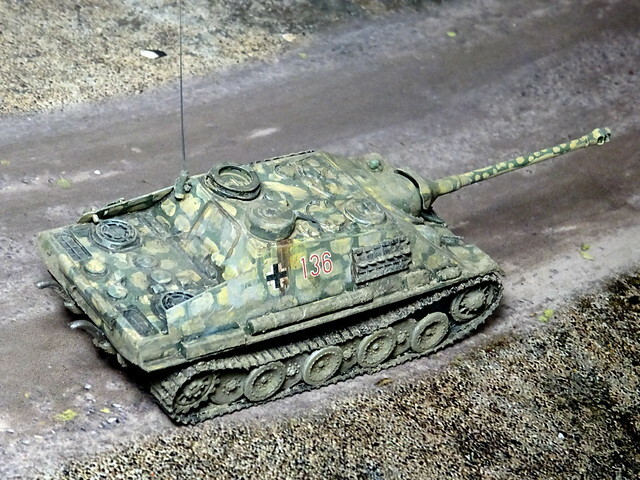 Similar schemes were, for instance, applied to some Ferdinand tank Hunters, operated in Italy and the Eastern Front, but also on Jagdpanthers at the Western front (e. g. in Belgium). The result reminds a bit of a Giraffe, or of the unique British "net" scheme applied to tanks on Malta. 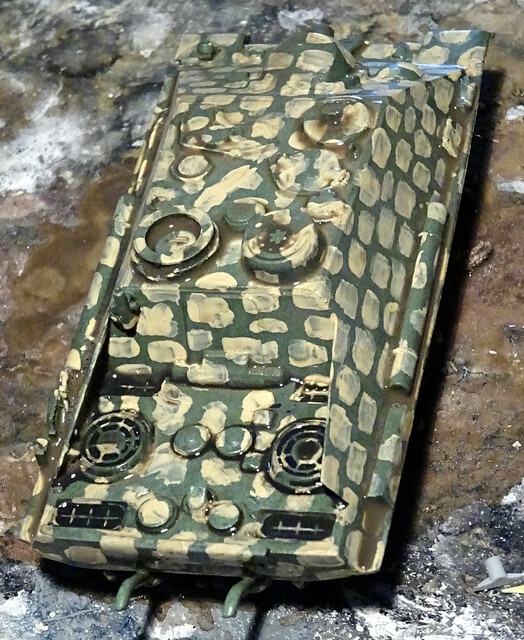 On top of the basic paintwork, a dark brown washing was added and the edges further emphasized through dry-brushing with light grey and pale sand tones, plus some acrylic silver. Once the wheels and tracks were fitted into place and the few decals applied, a coat of matt acrylic varnish was added. 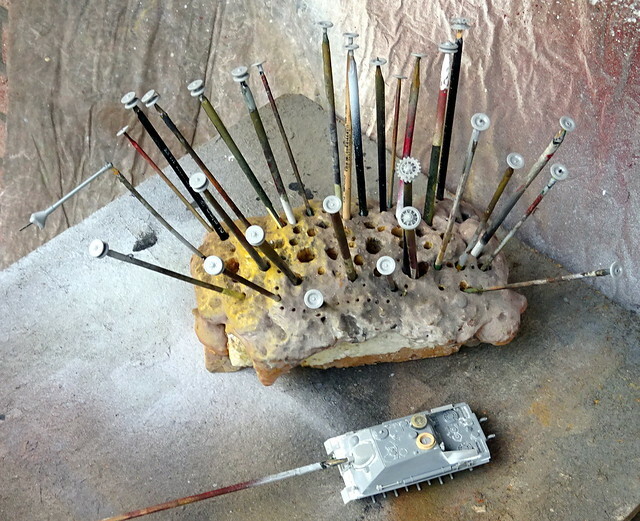 Finally, dust and dry mud were simulated with mixed pigments, applied with a soft brush onto wet stains of varnish. 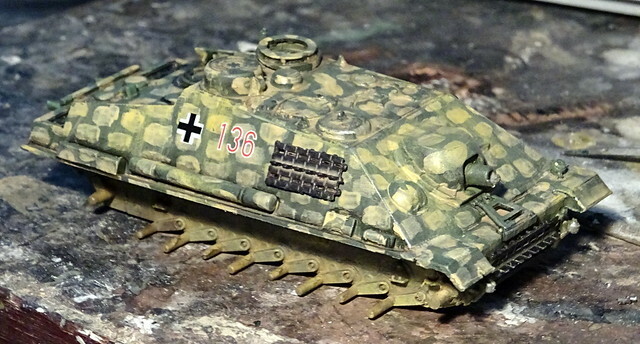 This E-25 tank hunter model looks pretty conclusive, and at first glance it looks very German, because it incorporates many typical design features. 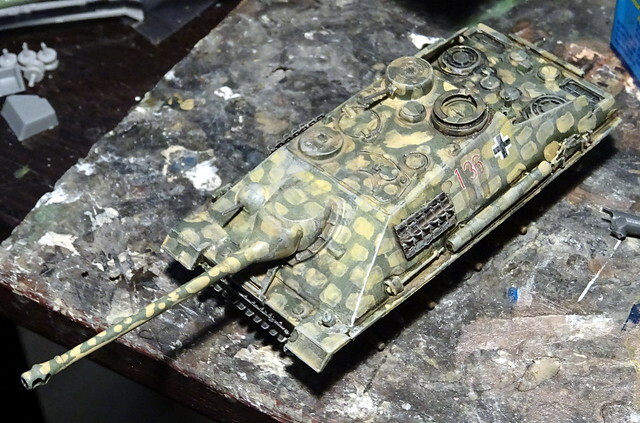 But the more you look the more “unique” it looks, e. g. through the low Schachtellaufwerk, the lowered Jagdpanther upper hull and its combination with the Saukopf gun mantlet from the Jagdpanzer IV. It looks very purposeful, and the paint scheme appears to be very effective, too, blurring the outlines and details well. Thank you. The poor track positions have been recitified in the meantime, they would not stick well to the wheels' upper sides, so that the beauty are not as pretty/convincing as I hoped for - but I had no time for a second try, sibce I had to post them on Saturday... With a good amount of white glue and a full day of curing time this has now be mended, but I leave things "as is". I am amazed how good the paint scheme works, though. When I was painting hull, it was already surprising how well it would blur details and outlines, and on some beauty pics it proves its effectiveness, too. Instead of gluing, I recommend sewing. Use a dark thread and sew the upper track to the wheel axles, so it hangs down on top of the wheels. It can be quite convincing, if done properly. I have heard about sewing vinyl tracks when closing them instead of glueing, but not for mounting them? It's an option, but probably very fiddly in 1:72, esp. with the limited space available? My (rarther blunt) white glue injection worked fine, though. Lokks much better now with the tracks hanging down all through the side. Beauty ! She looks like the sports car of the tank world. Love the camo !